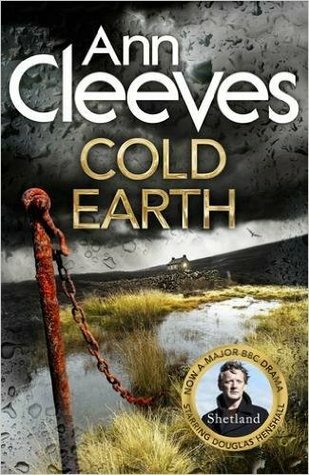 My book today is Cold Earth by Ann Cleeves, one of my TBR books, that I’ve just begun to read. The land slipped while Jimmy Perez was standing beside the grave. The dead man’s family had come from Foula originally and they’d carried the body on two oars, the way bodies were always brought for burial on that island. Outside the rain had stopped and a faint, milky sunlight filtered through the gloom. Instead of looking back towards Lerwick, Sandy headed towards Sullom Voe and stopped at the new hotel that had been built just outside the village of Brae. Its accommodation was used solely for oil, gas and construction workers and had been full since it had been slotted together like a giant bit of Lego several years before. Sandy had been inside once for the Sunday-lunch carvery. It felt a bit like going abroad and wandering into another world. I have read all the preceding Shetland books and watched the TV adaptations of Ann Cleeves’ novels, both the Shetland and Vera series. The books and the TV versions are separate things – the TV versions are based on Ann Cleeves’ characters but plotlines and the characters can differ. For example Cassie, Fran’s daughter, in the TV version is a teenager and goes to university, whereas in the books she is a child. I prefer the books, although I really appreciate seeing the beautiful setting and the scenery of both Shetland and Northumberland in the TV versions. I just love the way Cleeves conveys a sense of place and local culture, Margaret. And that beginning really shows it. I hope you’ll enjoy this one, and I look forward to your review of it. Margot, I have a feeling I’m going to love this book – I hope I’m right! Living in Scotland, I remember there being a fair bit of hype when the Shetland series started. I hadn’t realised it was originally a book though! Interesting that the two are so different. I might have to try them both to compare. Thanks! Do try the books at least, Louise. I’ve enjoyed them immensely. I’m hoping to begin reading this series at some point this year. I’ve watched the TV seasons that are available on Netflix – they don’t have the last one, sadly. I loved the scenery and am not surprised that they don’t follow the books faithfully. That’s OK. I had a great time reading or listening to the Vera books. Bet these will be just as good. I hope you’ll enjoy them too, Kay. I read the books first and although I think Douglas Henshall is a good actor he just doesn’t match the image of Perez I got from the books. I was put off Cleeves by the television version of Vera. I love Brenda Blethyn as an actress normally but I simply couldn’t credit her as a high ranking police officer. I have the first in the series on my kindle and I keep promising myself that I will read it, but I am getting nowhere. I’m not surprised the TV version of Vera put you off. For a start Brenda Blethyn is just wrong as Vera – too small for one thing, and in the early programmes the directing was appalling, with Vera and the others constantly walking as they talked – it made me feel dizzy. You’re right, she not credible as a high ranking police officer.The later programmes are better, but still not as good as the books, in my opinion. The Vera in the books is a very different character. I’m not familiar with this series. It is a setting I enjoy so I’ll have to give them a try. This week I am spotlighting Whispers Under Ground by Ben Aaronovitch as I try to finish a series I just discovered. Happy reading! The setting is beautiful, Kathy! I’ve tried reading Ben Aaronvitch’s Rivers of London, but it didn’t appeal much at the time. I keep telling myself to try it again as I know other people like his books. Sounds like a great read!! Happy weekend! Do try the books – hope you like them as much as the TV version. A landslide is just not what you expect to happen at a funeral, very gloomy indeed.